Hana' Fedora: Dreams are not Impossible If you want to further you studies, Why not! Dreams are not Impossible If you want to further you studies, Why not! I've been receiving a lot of emails from all over malaysia asking me questions on how to further their studies overseas either for Master or PhD. Questions like how do I choose which Universities are the best? How do I apply? Do I have to take IELTS or not? What are the requirements? It has been flattering and delighted to received emails and I'll be happy to help all of you out there and guide you through the process of applying based on my experience. Before you go further ask yourself what type of environment do you want? Some people says "nevermind Oxford or Cambridge, I want to go to Imperial because they offer best engineering courses and I will be living in London". Or maybe some people says "nevermind Imperial, I want to go to Southampton University because they offers best in Electrical Engineering and I'm doing Electrical not Civil and I hate living expenses in London". Some people care particularly on the courses that certain Universities offers but not the ranking of the universities or vice versa. For example Edinburgh university have good Actuaries course, king's college offers best in Medical and Law courses, Oxford Brookes are best for Architecture etc. 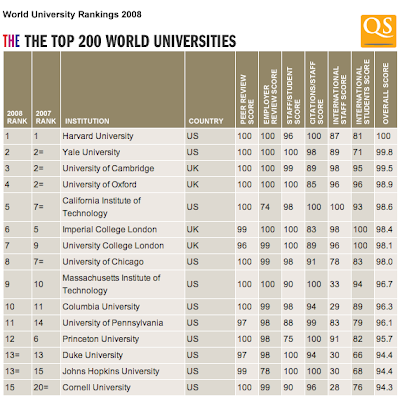 This was 2007 Universities ranking. The time when I was applying for my PhD. Click for larger image. Courtesy of Times Higher Education 2007. The first column is for 2007 ranking and the second column is for 2006. For me I would rather be in Oxford/Cambridge University eventhough they don't offer the best in Electrical Engineering like Southampton University because part of it I love being around nerds from other courses and be friend with them. But mostly because I love it that people all around the world (professionals and industrialist) recognized my degree are from. And I also enjoy the facilities they offers.I was this close to apply to Cambridge but the thought of leaving London? I would rather pass. But really it does depends on you. There is no right nor wrong. 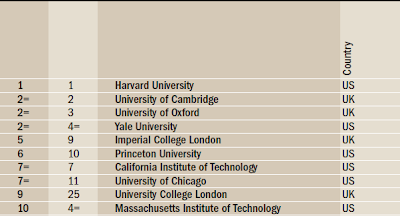 There are more other Universities out there which are also great. 1. And after you have decided which Univ you want to go, you can visit their websites by just google, check all the requirements and application process. Some Univ prefers online applications and some still prefers on paper. Requirements (such as degree results, IELTS grades, interviews, project results, work experiences etc) varies depend on different departments/schools in different universities. It will be easy for you to apply online. Its just a process of clicks. And wait for the offer. 2. After you have the conditional/unconditional offers from the University of your dream you can apply for any scholarships from any potential company, government etc. Or even better you can sponsor yourself! show them that you have the offer already but most sponsorships prefers the unconditional offer (conditions usually involve the acquire of transcripts and IELTS results). 3. Then you have everything complete you can now apply the Visa. For information visit VFS Global. The process sounds easy ain't it? But through the process you will have all the ups and downs which you have to endure (like visa applications, fulfilling certain conditions, financials etc). So I wish to any of you who are furthering their studies best wishes. Do email me if you have any more questions. This was last year 2008 ranking. the rest of the list you can check out in the website. 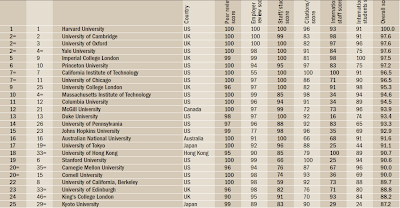 for Universities ranking you can check out the Times Higher Education website. may i know, u dpt fund utk study for master and phd from which source? please..i'm begging, if u help me to answer the above question, u can help me (or perhaps thousand of other people out there) to get some insight on how to fund their studies. the matter of which univ to apply, procedure, documents etc is not that complicated. it is just to secure a good bachelor's degree result, strong foundation of english and good recommendation. if anyone dpt sponsore from OXBRIDGE sekalipun, tp x berjaya dpt fund, eventually punah jugak harapan derang. i'm afraid i cant fulfill my dreams. if u give some generosity, honesty and sincerity in answering from where you got the fund, u can help many malays / malaysian yg ade talent for the future. SO WHY NOT TO ANSWER THE ABOVE SIMPLE BUT MEANINGFUL QUESTION. WISHING U ALL THE BEST!